I recently had a chance to spend a week behind the wheel of a 2015 Ram 1500 with the 3.0L EcoDiesel engine and in addition to the rigors of daily driving, I had a chance to put the most fuel efficient half ton truck to work – which made it very clear that this new, super-efficient diesel is every bit as good as it is made out to be. The vast majority of my reviews focus on the entire vehicle, but my this review of the 2015 Ram 1500 EcoDiesel focuses specifically on the new 3.0L diesel engine and how well it works as both a daily driver and a work horse. I have included pictures of the Laramie Longhorn Ram in which the EcoDiesel was fitted because, well, it’s a gorgeous truck inside and out. However, this piece isn’t about the two tone exterior with unique wheels and badging, or the plush, luxury level interior. This piece is all about addressing the absurd misconceptions being spread around the internet about the Ram EcoDiesel engine by people who have no experience with the truck. I will address the negativity in the best way that I know how – by putting this diesel half ton Ram through real world situations that show just how capable this engine is of being a super-efficient daily driver and a super-capable work truck, all in one. The new 3.0L EcoDiesel engine delivers 240 horsepower and 420lb-ft of torque to all four wheels via an 8-speed automatic transmission. This drivetrain combination makes the 2015 Ram 1500 the most fuel efficient truck in the segment with expected numbers of 19mpg around town, 27mpg on the highway and 22mpg combined. More importantly, those fuel economy figures are possible in a truck that will also tow 7,650lbs and haul about 1,040, so while it isn’t the strongest truck in the Ram 1500 lineup, the EcoDiesel in my Crew Cab, 4x4 test truck provides an impressive level of working capabilities considering that it gets better fuel economy than any truck in the half ton segment. All of those claims are impressive, yet they are the cause of much of the skepticism surrounding the Ram 1500 EcoDiesel engine. Some naysayers who obviously have no experience with the engine insist that it simply has to be a noisy, stinky, smoke-billowing diesel engine that is hard to deal with on cold mornings so driving it has to come with the same downsides of driving a Freightliner semi every day. The fact of the matter is that while the EcoDiesel sounds a little different than my own Hemi Ram 1500, it is no louder than the Hemi. At no point did it create any exhaust smoke at all and the only time you can actually smell the diesel exhaust fumes is when you are standing next to the exhaust tip while the truck is running. The Chrysler Group expected these negative views of diesel technology, so like every other light duty diesel engine sold in the USA, the EcoDiesel is quiet and clean enough that most people wouldn’t recognize it as being any different than any gas powered pickup on sale today. The first test of the 2015 Ram 1500 EcoDiesel was a day at the Detroit Auto Show, which meant that I was up and out the door before 6am. It had snowed quite a bit the night before and when I left for the show, it was a balmy 6 degrees at my house. I have had a few diesel test trucks in my day that were slow to start on cold mornings like this, but I stood in my nice, warm kitchen and watched through the window as the remote start fired the EcoDiesel to life with no effort. By the time I got into the truck it was toasty warm and the engine was ready to face the fight from my home to Detroit’s Cobo Hall. Needless to say, the 35 mile drive in the snow was a slow one, but the diesel engine didn’t react any differently than my Hemi does in the same situations. Also, after spending 7 hours at the auto show, I headed out to the truck, which had been sitting in a dark, cold garage that whole time and – not surprisingly – it started up right away. In terms of normal driving, the four wheel drive system made conquering the snow a breeze and when the roads cleared up, I had a chance to see how well the EcoDiesel performed in normal driving conditions. That brings me to another of the misconceptions about the Ram 1500 EcoDiesel, as I have had a few people tell me that they test drove one and they expected it to be faster. Now, considering that none of the other diesel trucks sold in the US are considered fast in stock form, I’m not sure why someone would expect the most efficient diesel truck engine in the US to be any different. Really, if “fast” is a concern in your truck buying process, you definitely want to buy the Ram 1500 with the Hemi, as that engine will satisfy all of your high speed truckin’ needs. That being said, for a truck that is the most fuel-friendly in the segment, the EcoDiesel Ram is surprisingly peppy. You don’t get the same oomph off of the line that you do with the Hemi (obviously), but the EcoDiesel affords the Ram 1500 plenty of low end acceleration and even more midrange pull. It is actually a little quicker from a stop than I had expected, and when cruising at speed, the EcoDiesel allows a very solid level of acceleration when you need to pick up speed suddenly, such as when merging onto the highway or hurrying around slower-moving traffic. As fuel-efficient half ton truck packages go, I believe that the Ram 1500 EcoDiesel offers the most fun to drive factor so while it won’t outrun the Hemi – it provides plenty of performance for daily driving in any situation. The 2015 Ram EcoDiesel pickup that I tested was expected to return fuel economy figures of 19mpg around town, 27mpg on the highway and 22mpg combined while also being able to tow over 7,600lbs and haul over 1,000lbs. Unfortunately, far too many people seem to think that if you hook up a 7,000lb trailer, fill the bed with 1,000lbs of lumber and drive to the top of Mt McKinley, you will get at least 27 miles per gallon in the process. Like every other truck sold in the US, the fuel economy figures are figured in a normal driving situation, which doesn’t include a bunch of weight in the bed or in a trailer out back. The Ram 1500 with the EcoDiesel engine will get better than 27mpg in the right highway conditions and it will comfortably tow my 5,000lb test trailer – but it won’t do both at the same time. Most people know this, but since some do not, I wanted to clear that up right away. With so much skepticism over the impressive fuel economy figures of the Ram 1500 EcoDiesel, I wanted to see if I could hit the advertised figure of 27mpg on the highway. To do this, I spent a few hours driving the local highways of Metro Detroit, stopping at one gas station to fill up and then filling up after logging over 200 miles of all-highway driving. During the course of my 3+ hour drive, I averaged right around 65 miles per hour and not only was I able to hit the average number of 27mpg – I exceeded it. During my all-highway drive, with the only stops being for gas and one traffic incident, I averaged 28.3 miles per gallon. My average fuel economy numbers weren’t quite as good, as the snow, the morning traffic, the towing and the hauling exercises all cut into the figures. Over the course of my best tank of diesel, I averaged just 19mpg, but that included a half tank or so of fuel burned with the trailer hooked up. Based on my experiences, someone who spends a great deal of time driving the EcoDiesel Ram on the highway will have no issues seeing those expected fuel economy numbers. So, after seeing how effortlessly the 2015 Ram 1500 EcoDiesel served as a great commuter vehicle on a bitter cold morning and seeing how it was able to exceed the EPA fuel economy figures, I wanted to see if this little diesel mill could do the work of the bigger engines – both diesel and gasoline. First off, I headed to the feed store, where the bed of my 2015 Ram 1500 EcoDiesel was loaded with 20 bags of horse grain weighing in at 50 pounds apiece, for a total of 1,000lbs of cargo out back. That is pretty close to the recommended paying capacity of my Ram 1500 Laramie Longhorn test truck, but it was hardly noticeable when driving back to the stables. At cruising speeds on the highway, I couldn’t tell that I had a thousand pounds of grain in the bed and around town, acceleration was barely hampered by all of the added weight out back. I did notice that the Ram didn’t corner as well around town with the loaded bed, but in terms of the relation to the EcoDiesel engine – the weight had no real impact. I imagine that if not for the concern of other components of the truck, this little diesel engine could deal with far more weight loaded into the bed. For all of my test vehicles that can tow, I have a horse trailer which loads up to right around 5,000lbs. This allows me to see how different vehicles tow relative to each other, so the Ram 1500 EcoDiesel towed the same trailer that I pulled with the Grand Cherokee SRT8 and the Ford 3500 diesel dually. It is a simple two-horse trailer with electric brakes and the integrated trailer braking system of my Ram 1500 test truck worked very nicely (as expected) with my trailer, but even without the aid of the trailer brakes, the Ram had no issue slowing down with my two-horse hooked up out back. So, the Ram 1500 EcoDiesel uses technology that is best known for pulling heavy trailers, but as one of the smallest diesel engines in the US truck market, there are some who question the 3.0L V6 diesel’s ability to perform like a proper diesel. Well, I can say with confidence that the Ram EcoDiesel towed my test trailer as well as any non-HD truck I’ve driven in the past few years. At no point did the small diesel engine seem to be struggling to pull my horse trailer, pulling away from stops effortlessly while also cruising at highway speeds without breaking a sweat. I have also pulled this same trailer with the Grand Cherokee EcoDiesel, and I think that the Ram with the same engine pulled it a little better, especially in terms of handling at higher speeds – but that is more about the chassis than the engine itself. In short, the answer to the question of “can the EcoDiesel do the work that the Chrysler Group talks about” is a resounding yes. I tow very regularly with my own truck and the EcoDiesel pulled well enough that I would recommend it to someone who spends a fair amount of time hooked to a trailer. It might be a small diesel engine, but it brings with it all of the pulling properties that you get from the Cummins – just with a lower capacity and far better fuel economy figures. If you are looking for a new half ton pickup that offers the best possible fuel economy of a four wheel drive truck, but you also want to be able to tow and haul and much weight as many V8 gas trucks, the EcoDiesel is absolutely the truck for you. This engine doesn’t come with any of the stereotypical downsides of “old diesel” technology yet it is comfortably capable of towing and hauling as much weight as many comparably equipped gas trucks that get far worse fuel economy. The Ram 1500 EcoDiesel is worth every bit of the attention that it has received since being introduced and for someone who wants the best fuel economy possible while still being able to do “truck stuff” – there is no better option on the market today. Click here for a closer look at my Ram EcoDiesel test truck, inside and out. 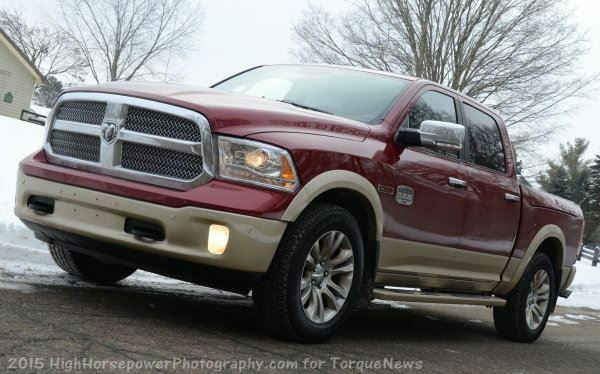 We own a RAM 2014 Laramie Ecodiesel ... What a great car! Until one day the problems "Maintenance DEF" coming ... since that day, our wonderful RAM is parked in the courtyard of the dealer until the engineers find a solution ... Yes, urea it freezes! not only that freezes, but it does not support well excessive heat either. When will the solution, especially when we hear about this major problem? No new manufacturer ... no apology or anything. What a disappointment and what a bad crisis management. English is this persons second language I think. Her comment is candid and well laid out. I too own a 2014 ecoDiesel but am in south Texas where I've not experienced problems with DEF freezing. Instead I had diesel exhaust venting into the cab and found there is a connection from the catalytic converter that has design flaws. Chrysler has reengineered the part but they have experienced shortages of the new part. I also had to replace the cruise control as well as the headlight sensor control unit - which took 4 visits to the dealer to sort out. Of course the electrical issues were not diesel related but simply added to my general heartburn. Just yesterday I noticed a strong chemical smell coming through the A/C ducts when the defroster was on on the morning. That is just one more thing for me to deal with. I want to like this truck. But what a pain it has been owning it so far. I have had an Eco diesel for about 6 months now. I use it to tow my machines( about 11k). Truck moves them effortlessly around town and in the snow. I have an 04 with the 5.9 and I would rather tow with this truck any day. Although it doesn't have the same stupid power of the cummins it has enough. Awesome truck. Haven't done 11k on the highway yet with my big machine but it did 10 no problem. I test drove one of these recently. I recently traded in my 2013 Ram 1500 Hemi. I loved that truck but I needed something I could tow behind my mototrhome. Bought a 2015 Jeep Wrangler Unlimited Sahara. It's fine and my kids love it. But I really miss having a truck. A friend of mine just bought a 2015 Ram 1500 4wd Laramie Longhorn with a sticker well north of 50 grand. It has every option. He paid about $48,000 for it. He loves it. I can't decide to go completely loaded or a 2wd Laramie with everything but the top end leather from the Longhorn and the trailer brake control. There is about a $9000 difference between a really nice 2wd eco diesel and the 4wd Mack daddy. As soon as I make the decision I am going to do it. Now they're into the second year of production and hopefully have gotten some of the glitches out of the new motor. I have had two Ram trucks previously with the only issue being a broken battery that was replaced under warranty. I made myself wait and not be an early adopter. Hopefully that decision will pay off. This engine should make my favorite half ton truck even better. Did anyone test the mileage when the truck was towing. Iown an F-150 with a 5.4 and when I tow (about 5000lbs) the mileage is cut in half. Is this diesel the same? we have a 2016 ecodiesel, our MPG swungs between 17-20 when we tow our 26' 5000lb camper. Just passed 8,000 on my 2015 Ram Bighorn Ecodiesel. There is a lot to love about this truck! For me, it has been the perfect combination of fuel efficiency, power, and luxury. I've had no problems so far other than a EVIC warning about the tail light being out when it is not out, but I've read it's an easy fix once I take it in. I do a lot of mountain driving in Colorado and this truck does really well up the hills. I've been averaging around 23.4 mpg, which is hard to believe for a vehicle this large and heavy. Drive one, you won't be disappointed! I bought one of these eco diesels, and am infactuated so far. The dealer here in so cal is wonderful, and has never complained to me about anything over the years. I guess I'm lucky to live near one of the best dodge dealers around. So far, zero problems with this vehicle. I truly anticipate that this will remain the same over the years. Albeit, I do take very good care of my vehicles, maybe that's a difference ? I've notice some have questioned the mileage while towing. My 2015 quad cab 4x4 ecodiesel still maintains an average of 19mpg highway with just over 7,000lbs in tow. It's been an amazing truck. No complaints. It tows with ease, steep grades really are no issue. I should also mention that I have modified the truck. It's had a leveling kit(lifted 2-1/2" in the front 1" in the rear) installed and is riding on 35x12.50 mud terrain tires, I was concerned that this alone would significantly decrease my mileage. Still averages 22 overall and 26 freeway and has had no effect on the power. Very very impressed. I also have a 2015 eco diesel with over 8000 miles on it now and I love it. Some of the concerns I heard about the truck on other web pages is that no one factors in the DEF fluid or the high cost of oil changes. Let me tell you if those are your two concerns/complaints we are all doing good. For my self personally its not even really about saving money with the better fuel economy. Lets face it, it would take us a long time to make the extra $5000 back in terms of fuel savings. However most cars/trucks have you returning to the gas station within about 400-450miles. My eco diesel gets me nearly 700miles before returning to the gas station. That in itself is huge in terms of TIME savings. On a side note I have a friend who had the half ton Toyota. He loves to trailer his bike every year from FL to Sturgis for the bike rally. On the way up he actually ran out of gas because in that truck he was only getting about 150 miles per tank and he hit a long section of highway without a gas station. On the way back he had to buy gas cans so he could pull over and fill up on the side of the road. He later traded the truck for the eco diesel and made the same trip with out needing gas cans. Wile pulling an 8000lb trailer he was able to cover over 400miles per tank. As for the DEF. my truck will make it well into the oil change on a single tank of DEF. I'm not sure how big the tank is but DEF is not that expensive and it will last me at least 10,000miles if not more. The oil changes are a little pricey but once again its only once every 10,000miles. To date I only had to return to the dealer 1 time in 10months of owner ship and that was to have a spray in bed liner installed per ur purchase agreement. Love this truck. Its a fluid that help decrease emissions and increases fuil economy. I'm not sure if its the DEF or if the truck is just that efficient but you dont even smell the diesel exhaust. Secondly if you buy any new diesel truck it will have DEF, I believe its government mandated. As for towing the truck it rated for just over 9'500 lbs. My buddy told me it towed the 8'000 with ease. However if you plan on towing that much often I would recommend the 2500. In my opinion any of the 1500 trucks are great for day to day travel, loading the back end with normal house waist, the weekly Home Dept run, or towing your boat occasionally to the lake. I know there are people that do it, but my opinion is that 1500 truck are too small to tow that much daily. Thank you so much for the info. It would be my daily driver, and will only tow my 7500 lb toy hauler about once every couple of months at the most. My current1500 with the hermi seems to handle it just fine. Thanks again. In theory it should be just at good as your hemi in terms of towing. It actually has a little more torque them the hemi but less hourse power. On paper I think its only rated for a few hundred pounds less then the hemi. Its not going to when any races however getting around someone on the interstate has never been an issue. In short it is a daily fuel efficient driver and an occasional 7500 lb tower. Just make sure you get the towing package with trailer braking. What rearend gear ratio are you running? I have 2015 ego-diesal, one thing I like very much is the ride, it don't ride like 3/4 ford I have and the towing my boat that weight in at 6500, not a issue towing that,..DEF $13.00 for two Gal. and tank hold 8 Gal. Bought our1500 Eco diesel a year ago and it performed so admirably until two weeks ago when the screen indicated a problem with DEF. The dealership replaced the pump and we drove it trouble free for 10 days and the warning re DEF appeared again. This time the truck was driven to the dealership were it could not be resuscitated! The techs. cannot diagnose the problem and calls to Windsor have not been answered yet. There goes our planned trip to the Yukon with family while we wait for answers if there are any. So disappointed. We have been told that Chrysler has never had this problem. I'm seriously considering buying a 16 outdoors-man mossy oak 1500 with the ecodiesel. I've read the review and I've read the comments I however haven't seen any complaints about the history of timing causing the engine to die. I guess I'm trying to see if the "Bolt" issue has been addressed? and if so when did they start to address it. I'd hate like hell to spend almost 50K and only get 100k of miles. Nearing 30,000 on my 2015 Ecodiesel. Engine appears to have developed an oil leak in the front. I can't tell if it's a gasket or what. No symptoms were noticed; just doing a routine inspection under the truck. It's at the dealership now being inspected. I hope it's nothing serious. Has anyone else had this issue? I baby this truck, so I cannot imagine what the problem is. This is for Jason and Kerry regarding DEF. There's a lot of bad information out there in regards to DEF. Diesel exhaust fluid is API (American petroleum institute) regulated substance that consists of 32.5% pure urea and 67.5% deionized water. Same people that regulate oil standards. Let's start with the DPF as theres confusion on those too. in 2008 the EPA mandated on road diesel regulations to have a substantial decrease in particulate matter (soot). The DPF is a filter that traps the soot so the exhaust is clean. Then when the filter gets plugged heat is required to remove the blockage. The engines then go through a regeneration process which essential dumps raw fuel into the exhaust, the fuel hits the diesel oxidation catalyst, produces temperatures about 1100 degrees F, that heat burns the soot out of the filter and turns it into an invisible gas, therefore cleaning the filter. When diesel burns the significant by products (besides awesome) are nitrogen oxides NO2, and particulate matter. NO2 = acid rain, particulate matter= our lungs don't like it (basically, I'm not a chemist). Increasing the combustion temperatures will more fully burn the fuel which will reduce the soot (soot is kind of unburned fuel). When you increase the combustion temperatures you successfully produce less soot and the end result is higher NO2 emissions. So, 2008+ manufactures used DPF's to catch the soot, then ramped up the combustion temperature with an air intake butterfly valve. This means theres less need for regeneration, though it pushes the NO2 emissions up substantially. Luckily, prior to 2008 there was a NO2 emissions EPA regulation which is what put EGR (exhaust gas recirculation) systems into our diesel. So, with added NO2, via the goal to decrease regeneration needs by decreasing soot, they increased the amount of EGR. EGR is dumb as it puts exhaust into the intake manifold which is... well, dumb. Well, here comes 2011! EPA says you diesel engine manufacturers need to decrease your NO2 outputs dramatically. Oh, no... now what?!. SCR!!! Sorry this is so long, I just want to help people understand what these systems are for. SCR stands for selective catalyst reduction. The diesel oxidation catalyst (DOC) reacts with the diesel fuel to make high amounts of heat to clean the DPF (diesel particulate filter). The SCR system in 2011-current (except 6.7 Cummins, they're so awesome and efficient they didn't have to use SCR until like 2014) diesels consists of a catalyst as well. The catalyst in the SCR system reacts with the NO2 that the diesel produces and converts it to hydrogen and water. The DEF does that as well. I think the catalyst and the DEF work together to produce an acceptable decrease. I think... Im confident... Certainly theres specifics in all of this but in a nutshell this is why we have what we have. So, to recap; Diesel burns, makes power, soot, and nitrogen oxides. Soot and NO2 are bad for everybody and everything. The leaders that try to do the right thing and set the standard for the rest of the world (America and I guess European Union) decided that we need less soot and NO2. The DPF was born to trap the soot. The SCR (DEF) was born to decrease the NO2. Diesels are now more efficient, and less of a hinderance on the environment than gas engine. All this emissions stuff can be bothersome at times. Sometimes problematic since there a lot of sensors and wires and algorithms that could hiccup. Sometimes when you remove those emission systems and retune the ECM's, you get an unbelievable amount of potential out of engines that are otherwise choked down. Some places you can get away with it, some can't. Derek, that was an absolutely astounding explanation! Thank you. "All this emissions stuff can be bothersome at times. Sometimes problematic since there a lot of sensors and wires and algorithms that could hiccup. Sometimes when you remove those emission systems and retune the ECM's, you get an unbelievable amount of potential out of engines that are otherwise choked down. Some places you can get away with it, some can't." Bothersome? Lots of sensors and wires and algorithms that could hiccup? Isn't your entire pickup truck basically composed of sensors, wires, and algorithms that are required in order for it to run and perform as expected? Hint, yes it is. Regarding your unsubstantiated emissions claims, please provide the large data set you examined, from a number of years of diesel pickups, where these problems you mentioned occur routinely....we'll wait...and wait...and wait... You're part of the bad information problem you mentioned at the beginning of your comment, and not a solution to solving it, when you write unsubstantiated claims such as "Sometimes problematic since there a lot of sensors and wires and algorithms that could hiccup." What rearend gear ratio would be recommended to pull a 7000# trailer occasionally?